Daluyon Beach and Mountain Resort in Puerto Princesa City, Palawan, Philippines has earned the Asean Green Hotel Award three times for consistently lowering its carbon footprint. A Filipino-owned resort hotel has won the coveted Asean Green Hotel Award not just once, but thrice. And the awards came, not just from the Philippines, but from all the 10 members of the Association of South East Asian Nations (Asean) in one of Asia's most prestigious events-the Asean Tourism Forum (ATF). Indeed, the Daluyon Beach and Mountain Resort has earned the Asean Green Hotel Award three times for consistently lowering its carbon footprint. All facing the white sand Sabang beach along the coast of the West Philippine Sea in Puerto Princesa City, Daluyon's villas are designed to have natural lighting and ventilation. The air-conditioning system is centralized using German technology fueled with liquefied petroleum gas. Daluyon is the only resort in Puerto Princesa, Palawan employing this German technology. Daluyon is also the frontier group and top-performing member of the Zero Carbon Resort (ZCR), a four-year project funded by the European Union for the sustainable development of the tourism sector and its value chain through reduced resource consumption and carbon emission. The ZCR project aims to enable small and medium tourism enterprises to operate their facilities in an energy-efficient way through the conduct of site audits, implementation of power-saving measures and the shift to renewable supply. Daluyon's guests are also encouraged to get involved in water-saving practices. They are provided with water-saving tips and given surprise tokens for implementing them, making the ZCR project an end-to-end multisectoral effort. The ZCR project was introduced to Daluyon owner and chief executive officer Butch Tan by Dr. Robert Wimmer of the Center for Appropriate Technology (GrAT) Austria. In a bid to share the GrAT-advocated technologies with fellow resort operators, Tan and Daluyon general manager Eduardo Baughman Gomez conduct ZCR presentations for the Palawan Council for Sustainable Development as project implementor. Gomez, who has handled managerial positions in prestigious hotels in Europe and the Middle East, says the resort also adheres to the use of green products-from the food in its fine-dining restaurant to the soap and lotion in the bathrooms. Vegetables are grown in the resort's organic garden, and tilapia in its freshwater pond. "We also implement waste segregation at source," Tan said, referring to the trash bins for cans and bottles, and biodegradable and non-biodegradable wastes. There are 27 spacious guest rooms in 12 villas facing the sea, all with luxurious appointments that seem to have brought to paradise all the modern comforts of a FirstWorld city, minus the chaos. The villas are also designed to prevent the sun from heating up the walls. The ceiling, while already heat-insulated with marine plywood, is fully covered by finely crafted and varnished bamboo slats that add to the elegance of it all. Sitting on a three-hectare property, this Puerto Princesa accommodation was developed without disturbing the natural terrain, even using its narrow and shallow creek as a channel to the reed bed for water filtration. Tan acquired the property in 2002 and started its operation in December 2007. But even at that time, he already envisioned the property to become an environment-friendly facility, intuitively knowing that it would become the nearest luxury resort to the now world-famous Puerto Princesa Underground River. The 8.2-km subterranean river is inside a 24-km cave of the St. Paul mountain range, but only 1.5 kilometers are allowed for a 45minute paddle boat tour. The tourists are brought to the beach at that segment of the mountain nearest to the underground river through a 20-minute motor boat ride from a nearby wharf, which is just walking distance from Daluyon. The river became one of the new 7 Wonders of Nature in 2012, when Daluyon earned its first Asean Green Hotel award at the Asean Tourism Forum (ATF) in Manado, Indonesia. The succeeding Asean Green Hotel awards at the ATF 2014 in Kuching, Malaysia and the ATF 2016 in Manila also saw Daluyon emerging among the few winners from the Philippines. Likewise, Daluyon gained the Asean Tourism Standard for 2014 and 2016, and a four-star rating just recently from the Department of Tourism. 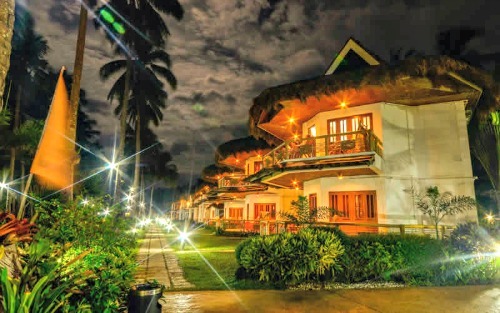 Daluyon Beach Resort accepts online bookings at www.daluyonbeachandmountainresort.com.